Monet Software is a cloud-based workforce optimization software that enables call centers to manage staff scheduling, performance and quality monitoring, and business reporting. The application offers an extensive series of features to suit busy call centers with high staff levels, offering visibility over all operations. Monet integrates with your existing ACD and PBX phone systems, pulling in historical data in order to forecast future call volume, agent requirements, and average call handle time. This data can be used in combination with the advanced scheduling tools to create staff schedules that match work rules, skills, holidays, breaks, budget and service levels. Monet's real-time adherence feature shows an on-screen live display of all call center and agent activity, such as who is on a call and who is available. This lets you evaluate how planned agent activity, forecasted call volumes, handle times and other KPIs match actual activity. Reports, dashboards, KPIs, and alerts give further visibility into call center activity. In addition to overseeing all business activity, Monet helps to evaluate individual agent performance through features such as call recording, screen capture, and speech and desktop analytics. Call quality scorecards can be created in order to share feedback with agents, plan for coaching, identify training needs and set goals. Monet has given us the ability to solve our shrinkage and adherence problem. We no longer need leads to constantly monitor the break schedule as our agents can always check when their next break time is. We've also been able to better plan for any periods of high shrinkage, which has ultimately cut down on call spikes and average wait times for our callers. In addition, Monet has an excellent support team that is always ready to help. Any issues I have usually end up getting resolved the same day. Implementation and training of the product was a breeze.The software allows for easy forecasting and an easy generation of rosters to each forecast. It usually takes me no longer than 30 minutes to an hour to finish a new set of schedules for the agents to see. It's also easier for us to plan ahead and figure out how many agents we will need through each season. I like the platform that has been provided for the agents in that they always have access to their schedules. Never again will I have to hear "I left my schedule at work!" The software allows for easy forecasting and an easy generation of rosters to each forecast. It usually takes me no longer than 30 minutes to an hour to finish a new set of schedules for the agents to see. It's also easier for us to plan ahead and figure out how many agents we will need through each season. I like the platform that has been provided for the agents in that they always have access to their schedules. Never again will I have to hear "I left my schedule at work!" Regarding the agents, I only wish a phone app or mobile site existed for Monet. I often hear that agents have trouble maneuvering the website on their mobile devices, but ultimately are able to do what's necessary. Monet is supported on all main browsers including Chrome, IE, Firefox, and Edge. Native mobile apps are on our roadmap as well. We have appreciated our almost 14 years using Monet at Compassion International. It provided the tool we needed to grow. Monet support has been wonderful in every stage of our partnership over the years. I can tell it is important to them that we succeed. We look forward to continued growth with this Monet software.The ability to easily forecast volumes and certain ACD queues. The ability to provide our reps with an intuitive schedule and ability to see live stats. The service is better than any vendor support, as the walked us through the roll out and training, so it was seamless from the reps to management. I don't recall having Monet go down, as it has been extremely stable. ROI has been tremendous, as our growth using this software has been smooth. The ability to easily forecast volumes and certain ACD queues. The ability to provide our reps with an intuitive schedule and ability to see live stats. The service is better than any vendor support, as the walked us through the roll out and training, so it was seamless from the reps to management. I don't recall having Monet go down, as it has been extremely stable. ROI has been tremendous, as our growth using this software has been smooth. I would say the inability to tie into our payroll system. Monet offers open API to support payroll, HR, and time and attendance systems to support common use cases such as time card automation, PTO usage / accrual automation and employee management. WFM Specialist, Club Med Sales Inc.
Monet paints a clear picture of our staffing needs. This has helped us reduce our ABA from 28% to under 3% from 2 years ago. The forecasting tool is fantastic and would recommend it to anyone! The staff, easy use of the program and it's stability, far exceeds any expectations. I can't imagine nor want to even think about using anything else. Monet is very easy to use and navigate through. We've had Monet for a few years now and if I do have any questions, the Monet employees are always more than willing to spend the time with me to assist. They are very patient and friendly! Monet is very easy to use and navigate through. We've had Monet for a few years now and if I do have any questions, the Monet employees are always more than willing to spend the time with me to assist. They are very patient and friendly! Although not to necessary, it would be nice if Monet could easily interface with our payroll system. Easy to use, great real time adherence and forecasting functions. We were able to more efficiently staff our department using the forecasting tools and utilizing real time adherence with all agents.Very easy to use, helps staff our agents where they can best be utilized most efficiently. Great real-time adherence displays, easy forecasting tools. Excellent customer service team. Very easy to use, helps staff our agents where they can best be utilized most efficiently. Great real-time adherence displays, easy forecasting tools. Excellent customer service team. The only addition I would make would be a fairness rule to assist in staffing weekends and holidays so it is fair to all employees. Monet is developing an all new, state of the art, scheduling engine that is targeted for an early 2019 release. The new scheduling engine will significantly expand the number of fairness rules that are supported by the Monet WFM product. We removed our excel based/paper/email based systems and took our KPIs to a new level. Improving RTA, decreasing OT, faster communication with agents and better reporting to the management team.Monet makes sense. It is easy to use and get started in WFM even with a large team. With a great "paced" deployment/engagement model we moved quickly through each key component and made a difference in the company. Monet makes sense. It is easy to use and get started in WFM even with a large team. With a great "paced" deployment/engagement model we moved quickly through each key component and made a difference in the company. Using all the components of Monet, there are some non mission critical components that need more attention. We are seeing that in the next release and hoping to see that trend continue. Submit a request for a price quote from the Monet Software webiste. Monet's built-in data import feature integrates with all major ACD /Contact Center Infrastructure and CRM systems so that you can monitor agent adherence and call history in real-time. Monet's agent adherence feature monitors & records the real-time actions & statuses of your workforce so that you can ensure schedules and KPIs are being followed. Use scorecards, real-time alerts, agent analytics, dashboards, reports and Monet Metrics - a set of pre-defined KPIs - to measure all areas of call center performance. Ensure quality across your service operations through speech analytics and desktop activity analytics - a set of monitoring tools to gain insight into customer interactions & internal processes. Monet offers advanced staff scheduling tools such as exception planning for one-off days off or training sessions, as well as intra-day management to schedule breaks, lunch and anything else. Below are some frequently asked questions for Monet Software. Q. What type of pricing plans does Monet Software offer? Q. 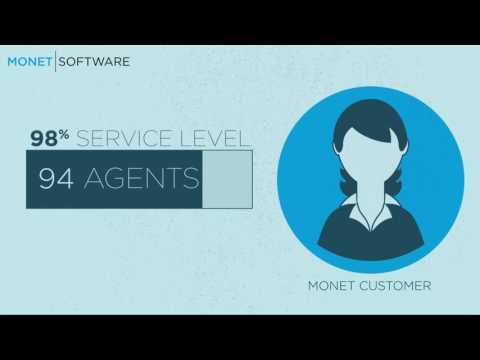 Who are the typical users of Monet Software? Q. What languages does Monet Software support? Q. Does Monet Software support mobile devices? Q. Does Monet Software offer an API? No, Monet Software does not have an API available. Q. What other apps does Monet Software integrate with? Q. What level of support does Monet Software offer? Q. Which apps is Monet Software compared to most often?